Australian Made Garage Kits with Site-specific engineering. Only available for Region A or Region B wind zones. Currently unavailable in NT, WA, SA & TAS due to freight. The NEW Cheap Sheds Garage Range is designed to meet the huge demand for affordable Australian Made residential garage kits. 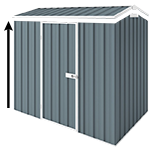 Cheap Sheds Double Garage with Workshop comes with 2 x roller door, a workshop area and measures 8.8m x 5.9m and 2.4m high (with the option to increase to 2.7m or 3m height). This is one of our latest garage designs which are manufactured in Queensland from high-grade Australian Standards steel. The engineering has been developed to guarantee a sturdy, safe structure for our customers by incorporating STRONGER C-Sections – proven to be up to 15% stronger than the equivalent industry standards. Each garage will be Engineered to Site Specific. This means the design is adjusted to suit your property to ensure its safe and suitable for where it will be built. All engineering and relevant site-specific documentation for local council approval applications will be supplied with all orders. These garages are only available for Region A and Region B in Australia.. Please refer to our Wind Zone section below. Currently unavailable in NT, WA, SA & TAS due to freight. The building comes flat packed in 2 Packages. Please note this is a large steel building, so the flat packs are heavy. You can extend the height of your walls from standard 2.4m high to 2.7m or 3m height. Add feature in the accessory section below. You can choose the location of your doors either the gutter end or gable end. Please consider it carefully. The basic kit comes with 2 Roller Doors but no Personal Access Door (PA). You can add 1 to your garage kit via the accessories. You can add windows or skylights to your Garage Kit via the accessory section. Skylights are a budget-friendly choice because they simply replace a steel roof panel. They are made of durable fibreglass and span 4 meters. Maximum of 2 for a Double Garage. Windows require some design alterations but adding a sliding window to a garage not only allows light but the ability to let fresh air in. The garages come in 13 different colours, including Zinc and you can customise it further by selecting a combination of colours for the roof, doors, trim and walls! Only available for Region A or Region B. Only Available in Non-Cyclonic QLD, NSW, ACT & VIC. We also recommend you check your local council. If you purchase a steel building not suitable for your area the council will decline your request. So to save yourself the hassle and costs, best to check your zone before purchase. 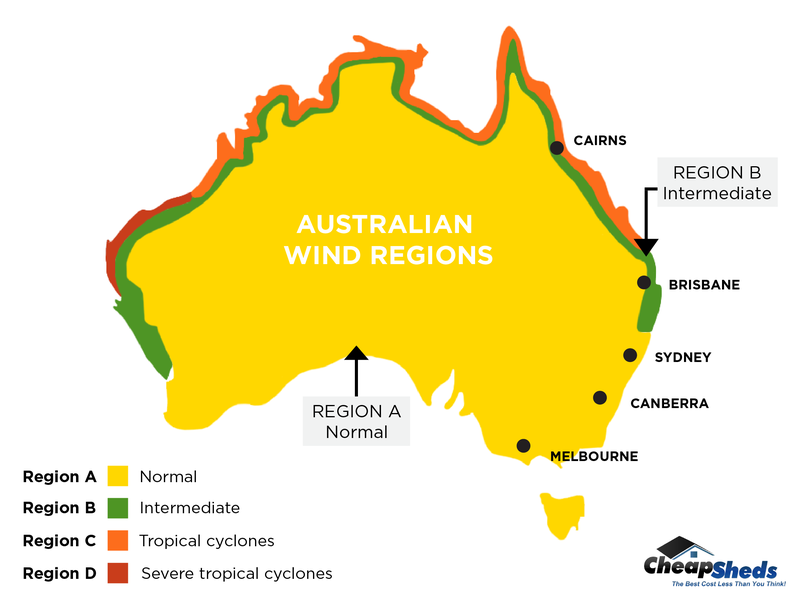 Please note, we can only supply this product in the following states due to site specifications and freight restrictions: NSW, ACT, VIC & Non-Cyclonic QLD. Garage kits are large steel buildings which are delivered to you flat packed. You will need a team to assemble these buildings, in some cases your council will require you to hire a professional. We recommend you hire a builder unless you have past experience and confidence with a structure of this size. Before assembly, you will need to consider your concrete slab or surface. Please refer to the plans and manuals provided to ensure the correct surface dimensions are met. Any questions or need advice please contact us and we will put you in touch our assembly help desk. The Cheap Sheds Garage kit are designed to be site specific which requires our professional team to develop the engineering plans and documentation. If your plans are not approved by the council your investment is refunded minus an engineering fee, $500. However, the documents are yours to own and make adjustments to. If you would like the engineering and relevant site-specific documentation PRIOR to purchase a $500.00 deposit will be required to design this detail. This deposit is non-refundable and will be deducted from the garage price at the placement of order. Window - can be placed at either gable or gutter end, 1 metre from the corner. Max of 1 for single garage and max of 2 for double garage. Personal Access (PA) Door - max 1 only per garage. Can be placed at either gable or gutter end, 1 metre from the corner.